Good morning! How is the year working out so far? I feel like I'm still on vacation! Today is Bret's last day of vacation, tomorrow we'll get back to our regular schedule. Sadly the regular schedule involves waking up early, and after more than a week of sleeping in.. even if it was just 7:30 or so... it's going to be painful. Honestly though, I know I do a lot better that way. I have this little tulip cut out, and so I'll start to get back in the groove with this. I am enjoying all the fresh new projects cropping up on Instagram and on Facebook. And people are serious about the sewing room clean up! Holy cow Sharon is killing it with the clear out! I have cleared out quite a bit lately, but my efforts are kids stuff compared to most! Wishing you a Happy New Year! May it be filled with fun quilting projects. Happy New Pam! Looking forward to lots of quilty fun and inspiration in the coming year! Have a happy new year! I've slowly been trying to get my sewing room cleaned up also. Happy New Year Pam! Lovely tulip...one of my faves. I am cutting out fabric today and messing up my sewing room nicely! This Tulip quilt is a must make for 2017 - love Lori Holt's Planner! I've been cleaning out my 1.5 basket of scraps and have been slowly making Log Cabin Blocks. 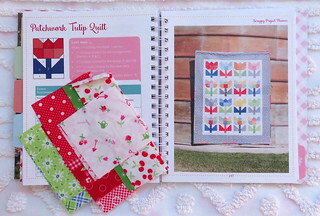 Lori's Scrappy Haystack Sampler Quilt is calling my name. Time for another cup of coffee now :)!